Disease caused by one of the two poultry-adapted strains of Salmonella bacteria, Salmonella Gallinarum. This can cause mortality in birds of any age. Broiler parents and brown-shell egg layers are especially susceptible. Chickens are most commonly affected but it also infects turkeys, game birds, guinea fowls, sparrows, parrots, canaries and bullfinches. Infections still occur worldwide in non-commercial poultry but are rare in most commercial systems now. Morbidity is 10-100%; mortality is increased in stressed or immunocompromised flocks and may be up to 100%. The route of infection is oral or via the navel/yolk. Transmission may be transovarian or horizontal by faecal-oral contamination, egg eating etc, even in adults. The bacterium is fairly resistant to normal climate, surviving months, but is susceptible to normal disinfectants. Bronzed enlarged liver with small necrotic foci, and/or congestion. Engorgement of kidneys and spleen. Enteritis of anterior small intestine. Isolation and identification. In clinical cases direct plating on Brilliant Green, McConkey and non-selective agar is advisable. Enrichment procedures usually rely on selenite broth followed by plating on selective media. Tube and rapid plate agglutination tests have been the standard serological tests for many years but have only been validated for chickens. LPS-based Elisa assays have been developed but not widely applied commercially. Differentiate from Pasteurellosis, pullorum disease and coli-septicaemia. Amoxycillin, potentiated sulponamide, tetracylines, fluoroquinolones. Biosecurity, clean chicks. As with other salmonellae, recovered birds are resistant to the effects of infection but may remain carriers. Vaccines for fowl typhoid have been used in some areas, both live (usually based on the Houghton 9R strain) and bacterins. Figure 32. Bacterial septicaemia caused by Salmonella Gallinarum, in young broiler chickens. 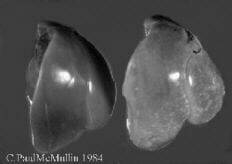 The liver on the left is normal, the one on the right is slightly enlarged, pale and shows focal necrosis. Similar lesions can be seen in Pullorum Disease and with other causes of septicaemia in young chicks.